In June, Bernie and Dave Morley will be taking a team from Central Washington University. They will be serving in much the same way and also painting our newest school in Morne Chaise. Pray for the students on this team, that God would use this time to affect their lives for His purposes. While the rest of us were in Tricotte, Vince Buys was in Port-au-Prince drilling wells. 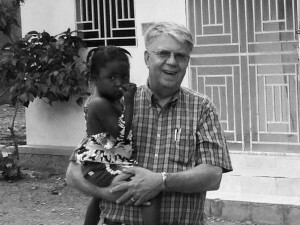 He was able to complete two wells, which will provide water for many of the older orphans who are in Port-au-Prince attending high school or university as well as for others who have been a part of Starfish Ministries. Construction has begun! Men with picks and shovels have dug the foundation, while others have been hauling sand, gravel, and rocks from the river about a mile away. Some used motorcycles with saddlebags while others used donkeys. And while we were there we watched the piles of materials grow every day. We hope to have construction completed late this year. We also met with a Haitian doctor who has some expertise in this kind of project. He has offered to help us through the next phase as we set up, equip, and staff the clinic. And the church in Tricotte continues to prepare for the role they will play in presenting the gospel to every patient who visits the clinic. Berlicia is one of our newest children. She arrived at the orphanage along with her brother in early May. She is already fitting in as the older children nurture her and look out for her. It is our desire to meet all of Berlicia’s needs. She now receives plenty of nutritious food, and she has a place to sleep. Her emotional needs are met by the orphanage staff and the older children. And in a couple of years she will begin school at the Starfish Ministries School in Tricotte. Pray for Berlicia and all of the children at the orphanage. Pray for all of their needs, but especially their spiritual needs. And thank you for your support. God continues to use your generosity to make this ministry possible.